Steve Coogan has backed an online campaign telling voters to ignore election coverage from right-wing newspapers like The Sun and the Daily Mail. Coogan, who last week starred in a video revealing his support for Labour, is supporting the campaign from online activist group Avaaz, which is also backed by Hacked Off. 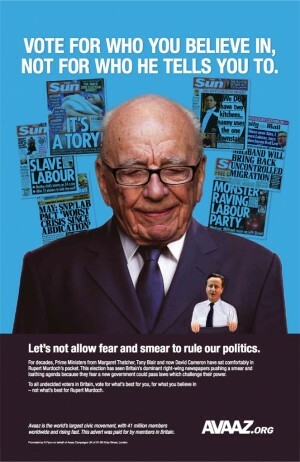 “To all undecided voters in Britain, vote for what’s best for you, for what you believe in – not what’s best for Rupert Murdoch,” the ad says. Coogan said: “Rupert Murdoch and the Daily Mail have had British politicians in their top pocket for decades. John Cleese and writer Irvine Welsh also back the campaign, with the former Fawlty Towers star adding: "The fear and loathing that has come out of the Mail and the Sun this election has been hard to stomach. Avaaz is running the campaign in regional newspapers covering marginal seats across Britain, among a range of other websites.